The Orkhon Valley encompasses 121.967 hectares, and can be found in Central-Mongolia. It also includes Kharkhorum, the 13th and 14th century capital of Chinggis (Genghis) Khan's vast Empire. The inclusion of this site is a tribute to Mongolia's nomadic culture, that even now persists. Further, it illustrates several significant stages in human history. First and foremost it was the centre of the Mongolian Empire; secondly it reflects a particular Mongolian variation of Turkish power; thirdly, the Tuvkhun hermitage monastery was the setting for the development of a Mongolian form of Buddhism; and fourthly, Khar Balgas, reflects the Uighur urban culture in the capital of the Uighur Empire. Karakorum nowadays is a small town in the center of Mongolia. There's even a road there from Ulan Bator, one of the few in Mongolia. The town hosts the country's major tourist attraction: Erdene Zuu monastery. So we weren't the only visitors here. 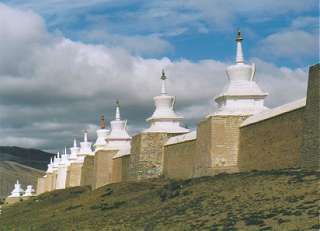 The monastery buildings are encircled by a wall of 108 white stupa's: just great! The next day, after staying the night in a comfortable ger-camp, we drove on to Tövkin Khid. 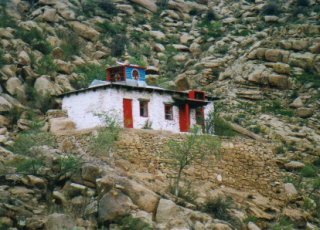 This is a smaller monastery in the mountains, a few hours from Karakorum. The drive to get there is completely off-road, crossing a river and driving along the paths in the grasslands. This day was undoubtedly the best day of my stay in Mongolia: I wished it would never end. The landscape around here is greener and more hilly than in the rest of Central Mongolia, and so pure. We also visited a nomadic family on the move, dismantling their ger with help from their neighbours. 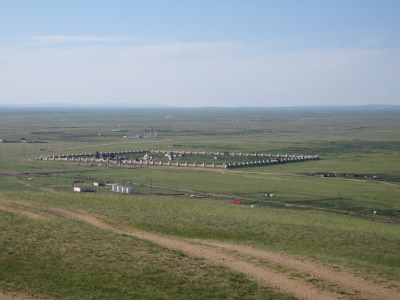 In the Orkhon-area you can see quite a number of gers from nomadic families, maybe because of the proximity of a 'big city'. This traditional way of living is still quite common in the rural areas, though I wonder for how long. The grasslands are getting drier and drier by the year. As an inveterate “listophile” I maintain a large number of travel-related lists. “Ancient Capital Cities of the World” is one – so the chance to “pick up” that of Ghengis Khan at Kharkhorin (“Karakorum”) in Mongolia was not to be missed! In fact, if you visit Mongolia, you are not likely to miss it. Mongolia has many merits as a destination (particularly its wonderful open spaces and the chance to see/experience a nomadic lifestyle) but historical remains are not a major feature. The nature of the country and its people’s lifestyle meant that Buddhist monasteries were the main permanent buildings and the Stalinist purges of the 1930s destroyed many of these. So, almost any tour of the country is likely to take in the main restored monasteries in Ulaan Baatar and Erdene Zuu. 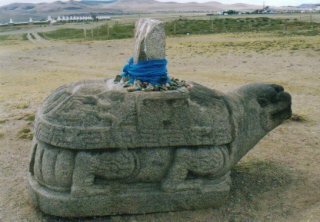 Mongolia has chosen to badge this WHS inscription as “Orkhon Valley Cultural Landscape” rather than specifically as “Karakorum” or the main monastery of the area at Erdene Zuu. A good choice I think. By including all the old sites AND the pastureland, still spotted by gers (yurts) and the herds of horses, yak and camels of nomad families, it ties together past and present very nicely and emphasises the continuity of lifestyle involved. The landscape of the valley and the nearby holy mountains with their shamanistic heritage provides a microcosm of Mongolian culture and is well worth spending a couple of days to see. We were a “group” of just 2 persons with a Mongolian guide/interpreter and the chance to visit/stay with families in their yurts and exchange experiences and questions on a near 1 to 1 basis was one of the highlights of the trip. Ger life is an interesting mixture of old and new – some families now have their own little wind powered generators for their TV batteries! Erdene Zuu is a remarkable place. I was lucky enough to be there almost on my own, and I found the atmosphere of remoteness and history almost tangible. Apart form the slightly tacky, but almost inevitable gift shop and trinket sellers it is possible to get a feeling for the amazing ancient society that was based around here. The town nearby is nothign to write home about, but was once home to Chinggis Khan and his warroir hordes. That they survived in such a remote place is one thing; that they ruled such a huge part of the world from such a place is something else entirely. 3.0: Stanislaw Warwas Vicente B. Avanzado Jr.
Bixi: 4 originally marked boundary of Karakorum, at least 1 or maybe 2 still in place. Symbol of Eternity. Petroglyphs: "Scattered widely across the nominated site are extensive remains of hundreds of Bronze Age graves some with stones engraved with herds of deer and images of the sun and moon." Silk Road: AB evaluation: "The broad, shallow river valley provides water and shelter, key requisites for its role as a staging post on the ancient trade routes across the steppes, such as those now known as the ?Silk Road?, and for its development as the centre of two of the vast central Asian empires." Writing systems: Early 8th-century Turkic memorials to Bilge Khan and Kul Tigin with their Orkhon inscriptions are admittedly the most impressive monuments from the nomadic Göktürk Empire. Syriac Churches: "Excavated items include domestic fragments as well as relics associated with ... Nestorian Christianity." Shamanism: According to the AB evaluation, the sacred mountains of Hangai Ovoo and Undor Sant are "strongly associated with the Shaman tradition of praying for health and prosperity to the forces of mountains, a tradition absorbed by Buddhism and still extant today." Located in a Former Capital: Karakorum 13/14th century Genghis Khan; Khar Balgas was the capital of the Uighur Empire, which governed the area for around 100 years in the 8th and 9th centuries. 38 Community Members have visited.